Gigaset recently launched a high performing and exceptionally contemporary home phone - the SL450A GO. The stylish home phone combines intelligent design with functionality. We have been testing it out over the past few weeks and are now ready to share our thoughts with you. The setup is very simple and does not take more than a few minutes. Insert the battery into the handset and charge it fully prior to the first use. Connect the base station to the mains power supply and to the fixed line network using the cables provided. You are now ready to make and receive calls. If you want to use Internet Telephony or access the internet or your home network, then you need to connect to the internet by linking the base station to the router. To make use of Gigaset GO functions you will need to install apps on your smartphone. The user guide that comes in the bundle explains everything. Let's now take a look at the appearance and build of the phone. The phone has a very stylish aluminium frame and comes with a large, 2.4 inch TFT colour display. The battery cover (back) has a sort of matte black finish. The charging cradle colour matches the phone and is lightweight but well-built. The base station is all black and has a paging key that helps you locate the handset. There are no sharp edges on the handset and it is beautifully crafted to fit perfectly and ergonomically in the hand. It is a very stylish and compact phone. Connect to a PC via micro USB or Bluetooth 2.0 (Windows and Mac operating systems) : This feature allows you to communicate wirelessly with other devices on your home network that use this technology (e.g. your smartphone or laptop). You can use Bluetooth to exchange directory entries on your smartphone and the home phone. Call display with picture: In addition to ringtones you can use images as caller id pictures. The phone has a pre-set bunch of images but you can download further images from your PC if your PC and the Gigaset phone have been synced. You can do this quickly and easily using the Gigaset QuickSync program which is free to download from the Gigaset website. Indoor range of 50m and outdoor range of 300m. Alarm function: Once you have set the date and time during the initial setup of the phone, you can activate the alarm clock. The alarm sounds for 1 minute and if no key is pressed it will be repeated after 5 minutes. Post the second repetition the alarm clock is deactivated for 24 hours. 500 phonebook contacts: You can store up to 500 contacts in the address book with three telephone numbers each. This can be done either by adding the entries or by copying contact details from your PC address book to the handset directory. I hate cold callers trying to sell me internet packages or offering me loans that I do not need. With the Gigaset SL450A's built-in nuisance call blocking technology, you can bid bye-bye to cold callers. Families with babies will find the 'Baby Monitor' feature of the phone very useful. When the baby monitor is turned on, a destination number (which you need to enter while setting it up) is called as soon as noise levels in the vicinity of the handset go beyond the defined noise level. The alarm to the destination number lasts for around 90 seconds. There is a 'Two Way Talk' feature that allows you to answer the alarm. The same feature turns on the loudspeaker on the handset which is located in your baby's room. Activating and de-activating the baby alarm is very easy and you can even deactivate the alarm remotely. Not only does this Gigaset SL450A phone look great but it also has loads of features that make it a very useful home phone. 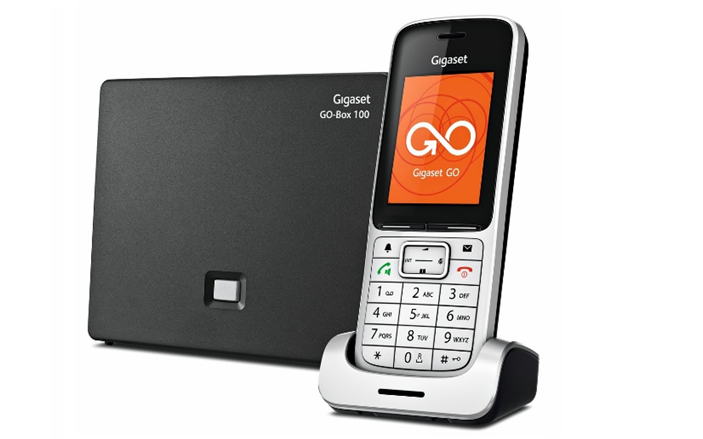 The Gigaset SL450A GO is available in single, duo and additional handset options which make it great for larger homes. This phone provides the same great quality that I have come to expect from Gigaset. Gigaset SL450A is available to buy from Amazon.co.uk with the prices starting from £99.99. So what do you think of the Gigaset SL450A? Like its features and stylish looks? Well, you could win yourself this brand new offering from Gigaset. All you need to do is enter the giveaway using the Gleam application below. Thanks for the chance to win this fabulous telephone. I would give it to my husband! I'd keep it as my phone is 5 years old and the battery is failing! Would be nice to have a new phone at home, thanks. Keep it for my christmas present! I've give this to my parents! Definitely give it to my parents - they'd appreciate it! We need a new phone so would keep it at ours. when he is at work. I would probably keep it. I'd definitely keep this, I've always wanted a Gigaset, they are superb phones. I love the cold caller feature! I would keep it myself as I'd love a new one, thanks. I'd keep it for myself - ours is rubbish! I would keep it as ours went along time ago. The phone looks great so will upgrade my own home phone if I was lucky to win. I would keep it. As my home phone seems to have a ghost inside it that makes it ring at stupid o'clock,not answer when I want it to!! I'd give it to my boyfriend because he's awesome! I'd have to keep it, I really need a new phone! Give to my mam. She needs a new one. I would keep it - we're about to move house & our current phones are on their last legs! I'd give the phone to my brother. I would definately keep it for myself! I'd keep it for myself! I'd actually keep it as I've been after a new phone like this for ages, and this review has confirmed that this is what I'd like. My old phone must be over 20 by now! I'd keep it for myself. I've had my current phone for over 10 years, so it would be nice to have an upgrade! I would give this to my parents who like the simpler to operate phones. I would keep this for myself at home as mine is past it. I'd keep it- our phone is rubbish! I'd give it to my mum as she doesn't like the phones they have. I would give it to my son. He is moving soon and hasn't got one. I would keep it for myself. Our house phone is pretty old now so could do with a new one! I would keep it I have been needing a new phone for a while. My phone is on it's last legs so would be very useful. I would keep it, as we are moving home soon and Ive been without a landline for almost 15 years now so i cant wait to get a proper phone hooked up and start making long phone calls again. I would keep it for our home, our handset doesnt hold its charge anymore. I would keep it myself because mine is wearing out, so very timely! I would keep for myself as could do with a new phone.